As election day draws near, we’re constantly reminded of how important it is to vote. This election has been highly contentious, with scandals and allegations emerging about both parties, from Clinton’s emails to Trump’s racism and sexism. It seems like half the commercials airing are campaign ads, and social media is flooded with endorsements. With November 8th so soon, swing states like Pennsylvania can make all the difference in who the next president will be. Now, thanks to the My Ride to Vote program, there really isn’t an excuse not to vote. 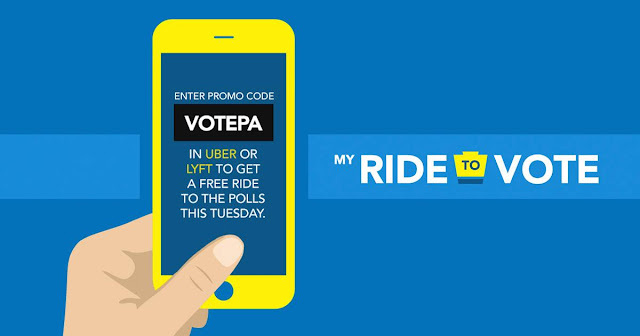 If you are eligible to vote and you live in Pennsylvania, simply download Uber or Lyft, enter the promo code “VOTEPA” and your ride to the polls on Tuesday will be free. So grab a few friends, pick a car service, and get out there, because your vote counts. Make sure to check out the official website, myridetovote.org, for more information, and for those who don’t need a ride but want to support the initiative, you can donate here.